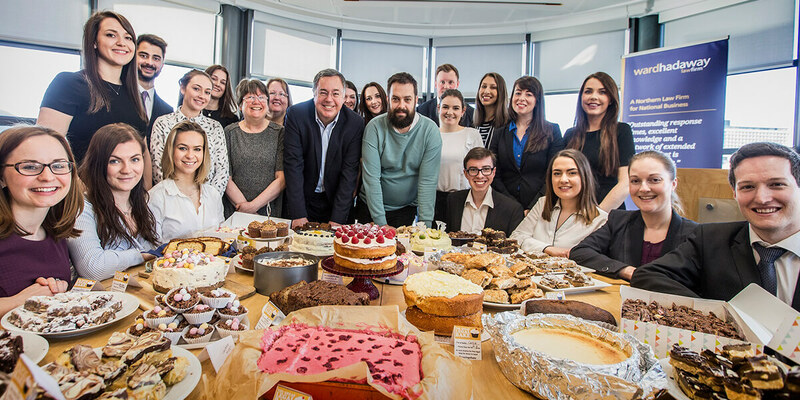 Amateur bakers across Ward Hadaway law firm have battled it out in this year’s Great Legal Bake to raise some dough for the Access to Justice Foundation. Events across all three of Ward Hadaway’s offices in Newcastle, Leeds and Manchester were organised by the firm’s trainees, Molly Bell, Lauren Howe and Hollie Walsh. And there were no sunken cakes allowed as this year’s competition was judged by no other than Masterchef: The Professionals finalist and Peace and Loaf restaurant co-owner, Dave Coulson. County Durham-born Dave was delighted to attend an event at Ward Hadaway’s headquarters on the Quayside in Newcastle to help judge the entries as members of the team battled it out in the boardroom for a slice of success. Dave has worked in some highly-regarded restaurants across the north east and beyond, including Michael Roux Jr’s two Michelin star rated La Gavroche. However he is also a firm believer in helping charities closer to home. More than 290 Great Legal Bakes have taken place between February 12th and 16th to raise money to help the most vulnerable people access justice via nine Legal Support Trusts across England, Wales and Scotland. Michelle Fleming, a solicitor in the commercial department at Ward Hadaway, recently joined the North East branch of the Access to Justice Foundation after promoting events while she was a trainee with the firm. She said “It’s really exciting to join the North East Legal Support Trust and to be part of a fantastic fundraising venture which distributes all funds raised to support free legal advice services across the North East. After the bake off, everyone taking part got the chance to buy and try slices of cake and other treats for £1 each. Jamie Martin, Managing Partner of Ward Hadaway, said: “We are delighted to take part in the Great Legal Bake again this year and are proud of the number of people across our three offices who have played a part in raising money for such a worthwhile cause.